Silver Creek 1502, newly Updated 2 bedrooms, 2 bath. Log burning fireplace, great family place! Whistlepunk 20, Wilderness Hideaway- ski in ski out, 2 bedeoom, 2 bath condo including a log burning fireplace! Whistlepunk 36, Almost Heaven- 1 bedroom with loft 2 bathrooms, log burning fireplace, warm and cozy for your ski vacation! 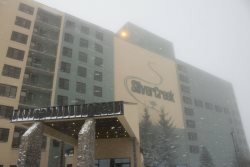 Silver Creek 1218 - 1 bedroom, 1 bath condo in Silver Creek Complex, ski in ski out, log fireplace, pool, hot tub! Powderidge 84 - Ski in ski out! 2 bedroom, townhome. Expedition Station 401- Ski in Ski out! Village center condo. Rimfire 460 - Good & Plenty - Ski in ski out, top floor, views of village! Balcony and hot tub! Powderidge 73 - The Horse You Rode In On. Is a ski in ski out condo, WIFI, unlimited long distance!